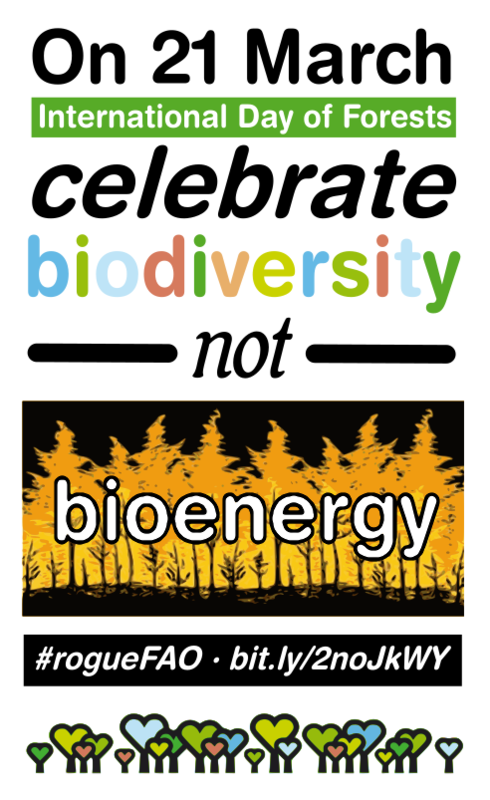 Examples of such bioenergy include biofuel plantations like palm-oil, and wood- based bioenergy which is the burning of wood from forests or plantations to produce electricity. Often, real forests are cut, and not just ‘wood wastes’ as FAO and industry claim. The growth in this industry is driven by massive subsidies and wood is even being imported from forests across the world to bioenergy plants especially in the EU to meet renewable energy targets. Studies in fact point out that such bioenergy is not renewable or carbon neutral. A massive 40% of global renewable energy supply now comes from woodbased energy – much more than that of solar, hydroelectric, or wind. A key question is, how will forests provide for such high energy demands being put on them, especially in the name of renewables? The growing trend in the Global South is a rise in monoculture tree plantations for biofuels, or wood. Biofuel plantations have already caused the clearing of rainforests and threatened animals and humans that depend on them. At the heart of the problem is that the FAO has been wrongly defining plantations as forests, erroneously calling them “planted forests,” thereby allowing the latters replacement by the former. It has been over ten years now since a strong global campaign against FAO’s problematic forest definition began. The FAO definition considers forests to be basically just “a bunch of trees”, while ignoring other fundamental aspects of forests, including the fact that forests are biodiverse, capable of supporting a web of life with so many other life-forms, plants, animals, insects, fungi, as well as forest-dependent human communities. It is not an exaggeration when activists call monoculture plantations ‘green deserts’—they bear little resemblance to natural forests and are incapable of supporting the web of life that is so crucial to the planet. The FAO thus ignores the vital contribution of forests to natural processes that provide soil, water and oxygen. The first decade of this century saw a policy boost towards jatropha plantation as a source of biofuel, especially in the central Indian state of Chhattisgarh where hundreds of thousands of acres of forest lands were forcibly planted with jatropha of whom, going by the official data, less than one fourth survived. In the process, agricultural lands, grazing land and forest commons were taken over by the overzealous forest department ignoring and clamping down on the rights of the forest dwellers as per the provisions of the Forest Rights Act, 2006. Recently, growing of oil palm plantations were observed in the forest department nurseries in Chhattisgarh, which is an ominous sign given the devastating impact of oil palm plantations in Indonesia. India’s effort to increase forest cover and therefore to show an increase in carbon stock and carbon sequestration has now got a financial boost through sharing of tax benefits for the states with forest cover according to the recommendations of the 14th Finance Commission. An estimated INR55,000 ($8.3 billion) crore forest-based fiscal transfer is being envisaged, which is more than 24 times the annual budget allocation for the Ministry of Environment, Forests and Climate Change in 2016-17. *Souparna Lahiri is currently a member of the All India Forum of Forest Movements and the Global Forest Coalition. He is a veteran of the forest movement in India. Souparna is an anti-carbon trade activist and has worked on exposing Clean Development Mechanism projects in India. He has also worked with communities resisting big hydro projects in north eastern India, monitored international financial institutions like the Asian Development Bank and its policies, worked on campaign for labor rights, defending human rights and rights and dignity of the street children in the past.